Hawk being launched in Seville, Spain. April 2011 – April 2011 — Delivery Skipper,a 1972 Waquiez Chance 37 ‘Hawk’. Assist owners to prepare and launch vessel and deliver from Seville, Spain to Figuiera da Foz, Portugal. Ondine in Figuiera da Foz. June 2011 – June 2011 — Delivery Skipper, ‘Ondine’ a 1972 Contest 29. Owner assisted delivery from La Roche Bernard, France to Figuiera da Foz, Portugal. Rubessa on her mooring in W. Mersea, UK. July 2011 – July 2011 — Delivery Skipper, Rubessa, Catalac 900. Collect boat from West Mersea, UK and deliver to Duquesa, Spain via Baiona to collect owner. Owner assisted from Baiona, Spain. Aug. 2011 – Aug. 2011 — Delivery Skipper, Windsong of Beaulieu, Vancouver Pilothouse 34. Owner assist routine delivery from Poole, UK. 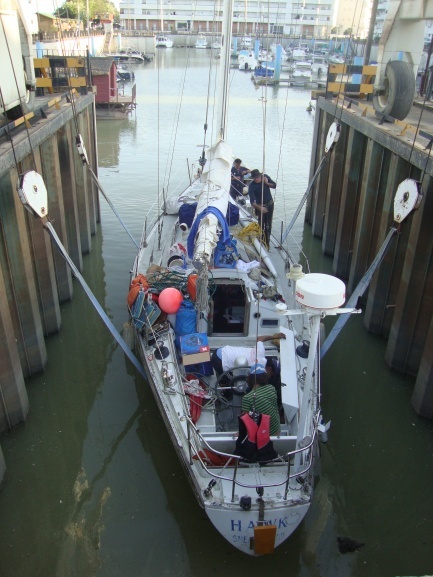 to Cascais, Portugal..
Sept. 2011 – Oct. 2011 — Delivery Skipper, Colin Hannah, 34ft plywood OD. Deliver boat and ‘owners crew’ from Cork, Eire. to Duquesa, Spain. Elle Bo in Nth Palm Beach..
Feb. 2012 – Oct. 2012 — Delivery Skipper, ELLE BO, 2001, 53ft Bruce Roberts Ketch. Deliver vessel from Nth Palm Beach, Florida to Fremantle, W. Australia.. Original route was via Cape Town.. however an engine room fire two weeks out forced a diversion to St Martin, FWI. The decision was then made to transit the Panama Canal and take the Pacific route via the Marquesas, American Samoa, Vanuatu and Darwin. Oct. 2012 – Nov. 2012 — Delivery Skipper, Van de Stadt Dogger 31, Blue Moon 2. Solo delivery from Perth, WA via Port Fairy to Port Huon, Tasmania..
Enjelouse in Frejus, S. France. April 2013 – May 2013 — Delivery skipper, Enjelouse, a 37ft Van de Stadt. An owner assist taking the vessel from Frejus, S. France and delivering it to Bezerte, Tunisia. Levanter in Viveiro, N. Spain.. Delivery Skipper, Levanter, 2013 Lagoon 380. Owner assist on a new Lagoon 380 from Les Sables de Ollones, France to La Gomera, Canary Islands. 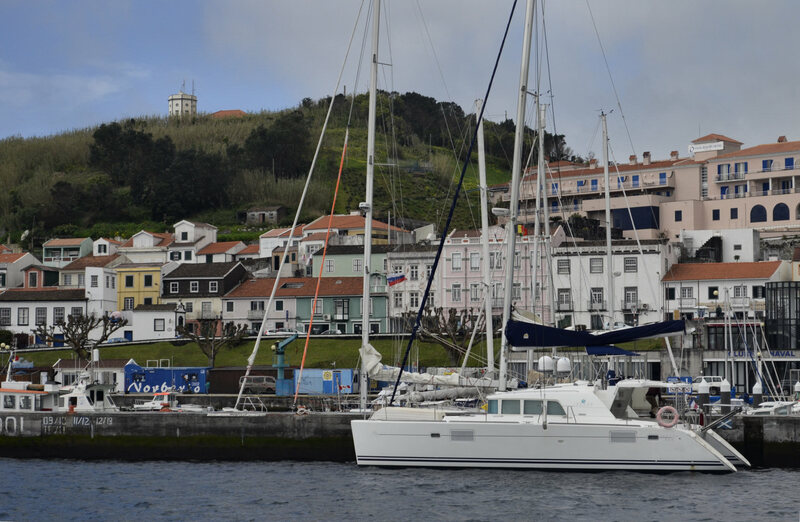 The original contract was for the boat to be taken to Gibraltar, however when we called into Cascais the owner got word his friend would be unable to join him there. He asked if I would mind taking him across to the Canaries instead..
Gran Canaria in time for the 2013 ARC. She was later re-named As You Wish by her new owner. Feb. 2014- April. 2014 – Delivery Skipper, Bonne Etoile. 2005 Lagoon 440. Preparation and delivery of the vessel from Ft Lauderdale via the Azores to Almerimar, E Spain. Aug. 1997 – Sept. 1997 — Delivery Skipper, Bullet, 1974 35ft Steel OD. Deliver vessel from Agua Dulce, Spain to Gallions Reach, London, UK. Dec. 1995 – Aug. 1998 — Skipper, Deep Water of Cowes, Longbow 33. Maintain vessel and sail from UK via France, Spain and Portugal to and around Mediterranean. Agua Profunda departing Agua Dulce, Spain. June 1998 – Sept. 1999 — Skipper, Agua Profunda, 1970 Carter 30. Oct. 2000 – Sept. 2001 — Skipper, Mewa, Beneteau 321. Collect vessel from St Martin, FWI. prepare for crossing and sail to Salcombe,UK. Moondance departing SailCraft B/yard Oriental, NC. Dec. 2004 – Aug. 2006 — Skipper, Moondance, Hunter 37. Preparing vessel for solo Atlantic crossing and delivery to Poole, UK. from Oriental, NC, USA. via Azores. 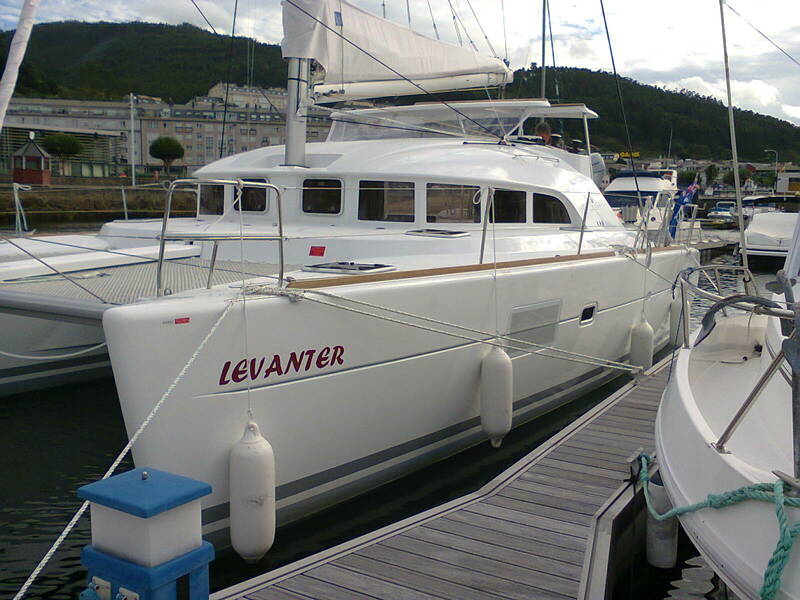 May 2008 – May 2008 — Delivery Skipper, Indianna, 2000 Beneteau Clipper 331. Delivery of vessel from Hayling Island UK to Olhao, Portugal with owner and wife as crew. Ti Amo anchored at Olhau, Portugal. Nov. 2006 – Oct. 2008 — Delivery Skipper, Ti Amo, 2006 Beneteau 331. Duties included preparing, upgrading and maintaining vessel after its purchase and collecting from Tortola, BVI. Nov. 2008 – Dec. 2008 — Delivery Skipper, Turnstone, 1972 Hurley 22. Solo Delivery from Brixham, UK. to Figuera da Foz, Portugal. Naiad ready to go in Harwich. July 2009 – Aug. 2009 — Skipper, Naiad, Corribee 21. June 2010 – Aug. 2010 — Delivery Skipper, Catonga, Catalac 9. Collect and prepare vessel in Ipswich, UK… and deliver by sea to Pendik, Turkey…. via Biscay, Gibraltar, Majorca, Sardinia, Sicily and Greek Islands.